Journaling has really become a thing more for adults than little girls these days. I find myself jotting down thoughts, Scripture or a recipe. I love using fun ink pens, colorful gel pens and even markers. This book is so much more than a journal though. Each day you will be given a prompt and you can write down stuff, draw pictures and even as I mentioned earlier use Scripture in your own “journey to joy”. I will be starting this on November 1st which will already be a unique day in our home because I will be having surgery that morning and HOPE to come home and start this journal that afternoon. Day 1- How is joy different from happiness? This seems like a great place to start and a great month to start when most people are already more focused on what they are thankful for, but do we really put focus on where our own joy comes from? We can easily say being a parent, spouse, even being someone’s child but lets dig deeper. True joy comes from so many places and with this book we can dive deeper into that. You’ll notice two pages at the end of this journal to write down songs that speak to you every day during your journey. Once you’ve written out your full playlist, please share it. Create it on Spotify and tweet it to @WaterBrookPress using #JoyfulPlaylist. 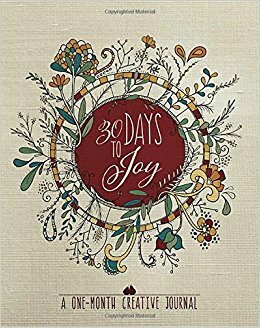 If you are looking to get your own copy of 30 Days to Joy: A One-Month Creative Journal check out Amazon.com. It is priced currently at $8.98 and it is a Prime product so if you order now it just may be on your doorstep in time to start your journey with me!